As I've said before, Wisconsin is not a Republican red state or a Democratic blue state. It is purple. Republicans currently hold five of the eight U.S. House seats, but Barack Obama carried seven of the eight in the last presidential election. Only the suburban Milwaukee area's 5th district went for John McCain. Republicans will have to draw some fancy congressional lines just to maintain their 5-3 edge in the House delegation, but it's definitely doable. Fairly minor tweaks to the 1st district in the southeastern corner and the lower Fox Valley's 6th could turn them into marginal McCain districts. Rest assured they also will try making the 7th district in the central and northwestern parts of the state into one that perhaps would never elect John McCain but might keep around Sean Duffy. If they want to get really flagrant about gerrymandering, it's even possi ble to create a solid 6-2 Republican advantage for U.S. House seats. 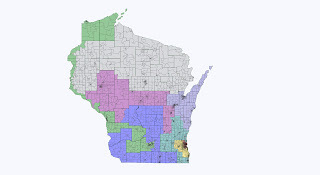 But it would take a map like this one, with Madison represented by the same member of Congress as the Apostle Islands. This is a preposterous map, but it is a testimony to what is possible by means of partisan gerrymandering. The mere fact that such political mischief is conceivable is reason enough for Wisconsin to move to a system of nonpartisan redistricting along the lines of the system already in place in Iowa. The nonpartisan Legislative Reference Bureau or the Government Accountability Board or both agencies together could draw the lines. And there could be a requirement added to state law compelling the map drawers to maximize the political competitiveness of the districts. We would then have voters choosing their representatives instead of the other way around. We would be drawing a better Wisconsin, not a redder or bluer one. Sure enough, the congressional delegation is quietly working behind the scenes on a gerrymandering plan to make the 7th district safer for Sean Duffy. The cat is out of the bag.